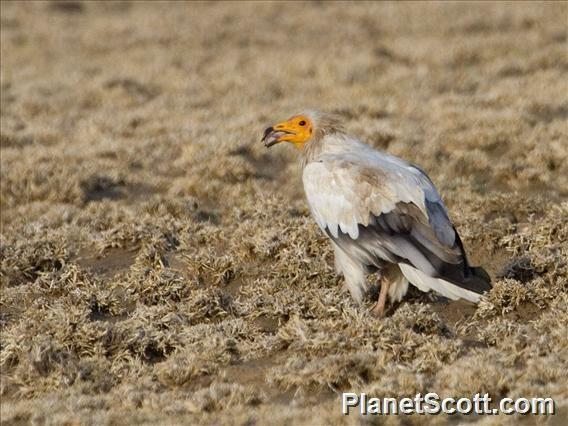 While the Egyptian vulture is normally a solitary bird, or is seen in pairs, large groups of vultures may congregate at feeding sites or at communal night roosts (2), usually on cliffs (4). Each day, these vultures may travel up to 80 kilometres in search of food (2), flying with strong, deep wing beats or soaring whilst surveying the ground (4). The Egyptian vulture is an opportunist and will feed on a huge range of food that it encounters. Carrion comprises the majority of its diet, including dead birds, small mammals, livestock and large wild animals (2). It will often feed just on the scraps of large carcasses after other vultures have consumed the majority of the soft flesh (2) (4). This undiscriminating bird will also scavenge on a wide range of organic waste, including rotting fruit, vegetables and even excrement (2), and will sometimes prey on small animals, particularly those weak or injured, such as rabbits, chicks, spawning or dying fish, and some insects (2). The Egyptian vulture also consumes eggs and, most remarkably, will throw stones at them to break open the shell – an incredible and rare example of tool-use in birds (6). The Egyptian vulture is largely a monogamous bird, and undertakes a courtship which includes undulating flights and mutual preening (4). The pair will construct a nest on a cliff, either in a cave or on a ledge protected by an overhang, or very occasionally in a tree. The nest is built of sticks and lined with masses of wool, hair, rags or the remains of food, and measures an impressive 1.5 metres across. Normally two eggs are laid, which are incubated for 42 days. Both parents incubate the eggs and feed the chicks until they fledge at the age of 70 to 85 days. Egyptian vultures become sexually mature at four to five years of age and are known to live for up to 37 years in captivity (2).